TRIVIA: Elvis's 1967 LP How Great Thou Art has a connection with RockOnTheNet.com. Answer here. Elvis Aaron Presley, the eventual 'king of rock and roll' was born on January 8, 1935 in Mississippi (born as twins, his brother was stillborn). Raised in Memphis, Elvis began his musical journey after high school in the early 1950s when he was discovered by producer Sam Phillips at Sun Records. July: Elvis first teamed up with guitarist Scotty Moore and bassist Bill Black to record "That's All Right, Mama" and "Blue Moon." July: Elvis signed a record deal with Sun Records and quit his truck drving job. Elvis signed with RCA Records. January: The Jordinaires start as Elvis's back-up group. January: Elvis's first big hit "Heartbreak Hotel" was released. March: Elvis Presley was released. March 10: Elvis hit the Top 40 on the Billboard Top 100 chart with "Heartbreak Hotel." April: Elvis signed a 7 year movie deal with Paramount Pictures. April 3: Elvis performed on The Milton Berle Show to huge ratings. April 21: Elvis topped the Billboard Best Sellers In Stores chart for 8 weeks with "Heartbreak Hotel." May 5: Elvis topped the Billboard Top 100 chart for 7 weeks and Most-Played In Jukeboxes chart for 8 weeks with "Heartbreak Hotel." May 5: Elvis topped the Billboard Best-Selling Popular Albums chart for 10 weeks with Elvis Presley. May 12: Elvis topped the Billboard Most Played By Jockeys chart for 3 weeks with "Heartbreak Hotel." June 2: Elvis hit the Top 40 on the Billboard Top 100 chart with "I Want You, I Need You, I Love You." July 28: Elvis topped the Billboard topped the Billboard Best Sellers In Stores chart for 1 week with "I Want You, I Need You, I Love You." August 4: Elvis hit the Top 40 on the Billboard Top 100 chart with "Hound Dog." August 11: Elvis hit the Top 40 on the Billboard Top 100 chart with "Don't Be Cruel." August 18: Elvis topped the Billboard Best Sellers In Stores chart for 5 weeks with "Hound Dog." September 1: Elvis topped the Billboard Most Played In Jukeboxes chart for 11 weeks with "Hound Dog / Don't Be Cruel." September 8: Elvis topped the Billboard Most Played By Jockeys chart for 8 weeks with "Don't Be Cruel." September 15: Elvis topped the Billboard Top 100 chart for 7 weeks with "Don't Be Cruel." September 22: Elvis topped the Billboard Best Sellers In Stores chart for 6 weeks with "Don't Be Cruel." October 12: Elvis hit the Top 40 on the Billboard Top 100 chart with "Love Me Tender." November: Elvis could be seen in his first film Love Me Tender. November 3: Elvis topped the Billboard Most Played By Jockeys chart for 5 weeks and Best Sellers In Stores chart for 5 weeks with "Love Me Tender." November 24: Elvis topped the Billboard Top 100 for 2 weeks with "Love Me Tender." December 1: Elvis hit the Top 40 on the Billboard Top 100 chart with "Love Me." December 8: Elvis topped the Billboard Best Selling Pop Albums chart for 4 weeks with Elvis. December 8: Elvis topped the Billboard Most Played In Jukeboxes chart for 1 week with "Love Me Tender." January: Elvis performed on the Ed Sullivan Show - a performance mostly remembered for the camera shots showing Elvis only from the waist up. January 26: Elvis hit the Top 40 on the Billboard Top 100 chart with "Too Much." February 9: Elvis topped the Billboard Best Sellers In Stores chart for 3 weeks with "Too Much." March 9: Elvis topped the Billboard Most Played In Jukeboxes chart for 1 week with "Too Much." April: The EP Peace In The Valley was released. April 6: Elvis hit the Top 40 on the Billboard Top 100 chart with "All Shook Up." April 13: Elvis topped the Billboard Best Sellers In Stores chart for 8 weeks with "All Shook Up." April 20: Elvis topped the Billboard Top 100 for 8 weeks with "All Shook Up." April 27: Elvis topped the Billboard Most Played By Jockeys chart for 7 weeks and Most Played In Jukeboxes chart for 9 weeks with "All Shook Up." July: The Loving You soundtrack was released. July: Elvis could be seen in the film Loving You. July 1: Elvis hit the Top 40 on the Billboard Top 100 chart with "(Let Me Be Your) Teddy Bear." July 8: Elvis topped the Billboard Best Sellers In Stores chart for 7 weeks with "(Let Me Be Your) Teddy Bear." July 15: Elvis topped the Billboard Top 100 for 7 weeks with "(Let Me Be Your) Teddy Bear." July 29: Elvis topped the Billboard Most Played By Jockeys for 3 weeks with "(Let Me Be Your) Teddy Bear." August 5: Elvis topped the Billboard Best Selling Pop LPs chart for 10 weeks with the Loving You soundtrack. October: Elvis could be seen in the film Jailhouse Rock. October 14: Elvis hit the Top 40 on the Billboard Top 100 chart with "Jailhouse Rock." October 21: Elvis topped the Billboard Best Sellers In Stores chart for 6 weeks with "Jailhouse Rock." November: Elvis' Christmas Album was released. November 4: Elvis topped the Billboard Top 100 chart for 6 weeks with "Jailhouse Rock." November 25: Elvis topped the Billboard Most Played By Jockeys chart for 2 weeks with "Jailhouse Rock." December: Elvis received his US Army draft notice. December 16: Elvis topped the Billboard Best Sellers In Stores chart for 1 week with "Jailhouse Rock." December 23: Elvis topped the Billboard Best Selling Pop LPs chart for 4 weeks with Elvis' Christmas Album. January 27: Elvis hit the Top 40 on the Billboard Top 100 chart with "Don't." February 10: Elvis topped the Billboard Best Sellers In Stores chart for 5 weeks with "Don't." March: Elvis was inducted into the US Army (serial # 53310761). March: Elvis' Golden Records was released. March 10: Elvis topped the Billboard Top 100 for 1 week with "Don't." March 17: Elvis topped the Billboard Most Played By Jockeys chart for 1 week with "Don't." April 21: Elvis hit the Top 40 on the Billboard Top 100 chart with "Wear My Ring Around Your Neck." July: The film King Creole was released. July 21: Elvis topped the Billboard Most Played By Jockeys chart for 1 week and Best Sellers In Stores chart for 2 weeks with "Hard Headed Woman." August: The King Creole soundtrack was released. August: Elvis was granted emergency leave from the Army when his beloved mom, Gladys, became ill and soon passed after Elvis is able to spend time with her. November 10: Elvis hit the Top 40 on the Billboard Top 100 chart with "One Night." February: For LP Fans Only was released. August 10: Elvis topped the Billboard Hot 100 chart for 2 weeks with "A Big Hunk O' Love." September: A Date With Elvis was released. January: Elvis became Sergeant Elvis Presley. February: 50,000,000 Elvis Fans Can't Be Wrong - Elvis' Gold Records - Volume 2 was released. March: Elvis was discharged from the Army. April 11: Elvis hit the Top 40 on the Billboard Hot 100 chart with "Stuck On You." April 25: Elvis topped the Billboard Hot 100 chart for 4 weeks with "Stuck On You." May: The ABC TV special Frank Sinatra's Welcome Home, Elvis aired. May: Elvis Is Back! was released. July 25: Elvis hit the Top 40 on the Billboard Hot 100 chart with "It's Now Or Never." August 15: Elvis topped the Billboard Hot 100 chart for 5 weeks with "It's Now Or Never." October: Elvis could be seen in the film G.I. Blues. October: The G.I. Blues soundtrack was released. November: The film GI Blues was released. November 14: Elvis hit the Top 40 on the Billboard Hot 100 chart with "Are You Lonesome Tonight?" November 28: Elvis topped the Billboard Hot 100 chart for 6 weeks with "Are You Lonesome Tonight?" December: The film Flaming Star was released. December 12: Elvis topped the Billboard Stereo Action chart for 3 weeks with the G.I. Blues soundtrack. January: His Hand In Mine was released. January 9: Elvis topped the Billboard Action Albums Monophonic chart for 3 weeks with the G.I. Blues soundtrack. February 20: Elvis hit the Top 40 on the Billboard Hot 100 chart with "Surrender." March 20: Elvis topped the Billboard Hot 100 chart for 2 weeks with "Surrender." April 10: Elvis topped the Billboard Top Stereo LPs chart for 4 weeks with the G.I. Blues soundtrack. June: Elvis could be seen in the film Wild In The Country. July: Something For Everybody was released. August 28: Elvis topped the Billboard Top Stereo LPs chart for 3 weeks with Something For Everybody. October: The Blue Hawaii soundtrack was released. November: Elvis could be seen in the film Blue Hawaii. December 18: Elvis topped the Billboard Top Stereo LPs chart for 19 weeks with the Blue Hawaii soundtrack. December 18: Elvis hit the Top 40 on the Billboard Hot 100 chart with "Can't Help Falling In Love." January 13: Elvis topped the Billboard Easy Listening chart for 6 weeks with "Can't Help Falling In Love." March: Elvis could be seen in the film Follow That Dream. March 24: Elvis hit the Top 40 on the Billboard Hot 100 chart with "Good Luck Charm." April 21: Elvis topped the Billboard Hot 100 chart for 2 weeks with "Good Luck Charm." July: Pot Luck was released. July: Elvis could be seen in the film Kid Galahd. October 27: Elvis hit the Top 40 on the Billboard Hot 100 chart with "Return To Sender." November: Elvis could be seen in the film Girls! Girls! Girls! December: Girls! Girls! Girls! was released. April: Elvis could be seen in the film It Happened At The World's Fair. April: It Happened At The World's Fair soundtrack was released. September: Elvis' Golden Records, Volume 3 was released. November: Elvis could be seen in the film Fun In Acapulco. December: The Fun In Acapulco soundtrack was released. March: Elvis could be seen in the film Kissin' Cousins. April: The Kissin' Cousins soundtrack was released. June 17: Viva Las Vegas opened in theaters starring Elvis and Ann-Margret. .
November: Elvis could be seen in the film Roustabout. January: Elvis could be seen in the film Girl Happy. January 2: Elvis topped the Billboard Top LPs chart for 1 week with the Roustabout soundtrack. April: The Girl Happy soundtrack was released. May 22: Elvis topped the Billboard Middle-Road Single chart for 7 weeks with "Crying In The Chapel." June: Elvis could be seen in the film Tickle Me. July 24: Elvis topped the Billboard Easy Listening chart for 2 weeks with "(Such An) Easy Question." August: Elvis For Everyone! was released. October 9: Elvis topped the Billboard Easy Listening chart for 3 weeks with "I'm Yours." November: The Harum Scarum soundtrack was released. December: Elvis could be seen in the film Harum Scarum. April: The Frankie And Johnny soundtrack was released. June: Elvis could be seen in the film Paradise Hawaiian Style. July: The Paradise, Hawaiian Style soundtrack was released. July: Elvis could be seen in the film Frankie And Johnny. October: The Spinout soundtrack was released. December: Elvis could be seen in the film Spinout. May: Elvis married Priscilla Beaulieu. May: Elvis could be seen in the film Double Trouble. June: Elvis could be seen in the film Easy Come, Easy Go. June: The Double Trouble soundtrack was released. July: The Clambake soundtrack was released. July: Elvis could be seen in the film Clambake. Elvis won a Grammy Award for Best Sacred Performance (How Great Thou Art). February: Elvis became a father to Lisa Marie. March: Elvis' Gold Records, Volume 4 was released. March: Elvis could be seen in the film Stay Away, Joe. June: Elvis could be seen in the film Speedway. October: Elvis could be seen in the film Live A Little, Love A Little. December 3: The NBC TV special Elvis ('68 Comeback Special) aired. December: Elvis ("The '68 Comeback Special") was released. June: From Elvis In Memphis was released. September: Elvis could be seen in the film Charro. November 1: Elvis topped the Billboard Hot 100 chart for 1 week with "Suspicous Minds." December: Elvis could be seen in the film The Trouble With The Girls. January: Elvis could be seen in the film Change Of Habit. April: In Person At The International Hotel, Las Vegas, Nevada was released. May: Let's Be Friends was released. June: On Stage - February, 1970 was released. June 20: Elvis topped the Billboard Top 40 Easy Listening chart for 1 week with "The Wonder Of You." August: Worldwide 50 Gold Award Hits, Vol. 1 was released. November: Almost In Love and Elvis Back In Memphis were released. November 28: Elvis topped the Billboard Top 40 Easy Listening chart for 1 week with "You Don't Have To Say You Love Me." December: Elvis met with President Nixon. December: That's The Way It Is was released. December: Elvis could be seen in the film Elvis - That's The Way It Is. January: Elvis Country (10,000 Years Old) was released. March: You'll Never Walk Alone was released. June: Love Letters From Elvis was released. August: The Other Sides - Worldwide Gold Award Hits, Vol. 2 was released. November: I Got Lucky was released. Elvis Sings The Wonderful World Of Christmas was released. February: Elvis Now was released. April: He Touched Me was released. June: Elvis sold out 4 performances at Madison Square Garden. July: Elvis As Recorded At Madison Square Garden was released. November: Burning Love And Hits From His Movies, Volume 2 was released. Elvis won a Grammy Award for Best Inspirational Performance (He Touched Me). February: Separate Ways and Aloha From Hawaii Via Satellite were released. April 14: Elvis topped the Billboard Top Country Albums chart for 4 weeks with Aloha From Hawaii Via Satellite. May 5: Elvis topped the Billboard Top LPs & Tape chart with Aloha From Hawaii Via Satellite. June: Elvis could be seen in the film Elvis On Tour. July: Elvis (The Fool Album) was released. October 9: Elvis and his wife Priscilla were divorced after 6 years of marriage. October: Raised On Rock / For Ol' Times Sake was released. February: Elvis - A Legendary Performer, Volume 1 was released. March 30: Elvis topped the Billboard Top Country Albums chart for 2 weeks with Elvis - A Legendary Performer, Volume 1. April: Good Times was released. July: Elvis Recorded Live On Stage In Memphis was released. November: Having Fun With Elvis On Stage was released. Elvis won a Grammy Award for Best Inspirational Performance ("How Great Thou Art"). February: Promised Land was released. March 8: Elvis topped the Billboard Top Country Albums chart for 1 week with Promised Land. April 5: Elvis topped the Billboard Top 50 Easy Listening chart for 1 week with "My Boy." February: Elvis - A Legendary Performer, Volume 2 was released. April: The Sun Sessions was released. May: From Elvis Presley Boulevard, Memphis, Tennessee was released. June 10: Elvis topped the Billboard Top Country Albums chart for 4 weeks with From Elvis Presley Boulevard, Memphis, Tennessee. February 19: Elvis topped the Billboard Country Singles chart for 1 week with "Moody Blue." April: Welcome To My World was released. June: Elvis performed in Indianapolis - his last live performance. July: Moody Blue was released. August 6: Elvis died at Graceland of heart failure. August 20: Elvis topped the Billboard Country Singles chart for 1 week with "Way Down." September 3: Elvis topped the Billboard Country Albums chart for 10 weeks with Moody Blue. October: Elvis In Concert was released. November 12: Elvis topped the Billboard Country Albums chart for 5 weeks with Elvis In Concert. May: He Walks Beside Me was released. Elvis Sings For Children And Grownups Too! was released. November: Elvis - A Canadian Tribute was released. January: Elvis - A Legendary Performer, Volume 3 was released. March: Our Memories Of Elvis was released. Our Memories Of Elvis, Volume 2 was released. August: The box set Elvis Aaron Presley was released. February: Guitar Man was released. February 21: "Guitar Man" hit the Top 40. March 14: Elvis topped the Billboard Country Singles chart for 1 week with "Guitar Man." April: This Is Elvis was released. December: Elvis - Greatest Hits, Volume One was released. August: Pure Gold was released. May: I Was The One was released. November: The box set Elvis - A Golden Celebration was released. March: A Valentine Gift For You was released. Elvis was inducted into the Rock & Roll Hall of Fame. January 26: : Elvis was posthumously honored with the Award of Merit at the American Music Awards. August: The Number One Hits and The Top Ten Hits were released. February: The Million Dollar Quartet was released. August: The box set The King Of Rock 'N' Roll - The Complete 50's Masters was released. December: Blue Christmas was released. October: Amazing Grace: His Greatest Sacred Performances was released. December: If Every Day Was Like Christmas was released. October: The box set Walk A Mile In My Shoes: The Essential 70's Masters was released. August: The box set Platinum: A Life In Music was released. September: Greatest Jukebox Hits was released. May: Elvis ranked # 8 on VH1: Greatest Artists of Rock & Roll (and # 3 on Rock On The Net's Poll). July: The box set Artist Of The Century was released. November: A British poll of over 600,000 people named Elvis as Best Male Artist of All-Time. December: Elvis came in at # 4 with the top-selling Artists of the Century. December: It's Christmas Time was released. January: VH1: 100 Greatest Rock Songs included Elvis hits: "Jailhouse Rock" at # 18, "Hound Dog" at # 31, "All Shook Up" at # 68, and "Heartbreak Hotel" at # 71. September: The box set Peace In The Valley: The Complete Gospel Recordings was released. October: Country Collection was released. January: VH1: 100 Greatest Albums includes Sun Sessions at # 21. July: The box set Live In Las Vegas was released. September: The 50 Greatest Love Songs was released. November: White Christmas was released. March: Elvis: The Very Best Of Love was released. July: The box set Elvis: Today, Tomorrow & Forever was released. July 13: Elvis topped the Billboard Hot 100 Singles Sales chart for 3 weeks with "A Little Less Conversation" with help from Junkie XL. September: VH1: 100 Sexiest Artists includes Elvis at # 2. October: Elvis: 30 #1 Hits was released. October 12: Elvis topped the Billboard 200 chart for 3 weeks, Top Internet Album Sales chart for 2 weeks, and Top Country Albums chart for 3 weeks with Elvis: 30 #1 Hits. January: Elvis 56 was released. July: The box set Close Up was released. September 27: Elvis topped the Billboard Hot 100 Singles Sales chart for 2 weeks and Dance Singles Sales chart for 12 weeks with "Rubberneckin'." October: 2nd To None was released. October: Elvis topped the Billboard Hot Dance Singles Sales chart with the 'Paul Oakenfold Remix' of "Rubberneckin'." November: Christmas Peace was released. November: 2nd To None was certified platinum. December: Rolling Stone: The 500 Greatest Albums of All Time: # 11: The Sun Sessions, # 55: Elvis Presley, # 190: From Elvis In Memphis. April: Rolling Stone: The Immortals - The 100 Greatest Artists of All Time included Elvis at # 3. December: Rolling Stone: The 500 Greatest Songs of All Time included "Hound Dog" at # 19, "Heartbreak Hotel" at # 45, and "Jailhouse Rock at # 67. January: Elvis's "Jailhouse Rock" topped the singles chart in the UK followed the next week by "One Night" and "It's Now Or Never." May: Elvis By The Presleys was released coinciding with a CBS miniseries about Elvis. December: Elvis: 30 #1 Hits was certified 4x platinum and It's Christmas Time was certified 2x platinum. January: The box set Elvis #1 Singles was released. January: Elvis's "Heartbreak Hotel" topped the Billboard Hot Singles Sales chart. January 2: Essential Elvis Presley was released. September: The DVD Elvis #1 Hit Performances was released. August: The box set Complete '68 Comeback Special: 40th Anniversary Edition was released. October: Elvis Presley Christmas Duets was released. December: Rolling Stone: 'The Greatest Singers' includes Elvis at # 3. August: Elvis: 30 #1 Hits was certified 4x platinum. December: The box set Elvis 75 - Good Rockin' Tonight was released. August 4: Essential Elvis Presley was certified gold. November: Viva ELVIS - The Album was released. July: I Am An Elvis Fan (a collection of songs chosen by fans) was released. November: The 2CD/1DVD set Prince From Another Planet was released. September 16: Elvis could be heard on the Barbra Streisand LP Partners on the track "Love Me Tender." September 5: Elvis Presley Forever topped the Billboard Rock Albums chart. The compilation was sold through the U.S. Postal Service in conjunction with the promotion of the new Elvis Presley commemorative stamp. October 30: If I Can Dream (with the Royal Philharmonic Orchestra) was released. November 12: If I Can Dream topped the UK LP chart. March 3: Essential Elvis Presley was certified platinum. October 21: The Wonder Of You: Elvis Presley With The Royal Philharmonic Orchestra was released. November 3: The Wonder Of You: Elvis Presley With The Royal Philharmonic Orchestra topped the UK LP charts. 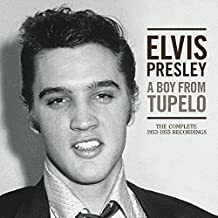 July 28: A Boy From Tupelo: The Complete 1953-1955 Recordings was released. March 8: Christmas Peace, Artist Of The Century, Greatest Jukebox Hits, Elvis Presley Christmas Duets, and Peace In The Valley: The Complete Gospel Recordings were certified gold. Elvis - A Legendary Performer, Volume 1 was certified 3x platinum. It's Christmas Time was certified 4x platinum. Elvis: 30 #1 Hits was certified 6x platinum. April 6: The soundtrack to the documentary Elvis Presley: The Searcher was released. August 10: Where No One Stands Alone was released and featured prior released tracks and new debut with Lisa Marie Presley. November 30: The box set Elvis: '68 Comeback Special: 5th Anniversary Edition was released. Tracks: "(There'll Be) Peace In The Valley (For Me)" - "It Is No Secret" - "I Believe" - "Take My Hand, Precious Lord"
Tracks: "I Need You So" - "Have I Told You Lately That I Love You" - "Blueberry Hill" - "Is It So Strange"
Tracks: "Love Me Tender" - "Let Me" - "Poor Boy" - "We're Gonna Move"
Tracks: "Santa Claus Is Back In Town" - "White Christmas" - "Here Comes Santa Claus" - "I'll Be Home For Christmas" - "Blue Christmas" - "Santa Bring My Baby Back (To Me)" - "O Little Town Of Bethlehem" - "Silent Night" - "Peace In The Valley" - "I Believe" - "Take My Hand, Precious Lord" - "It Is No Secret (What God Can Do)"
Tracks: "That's All Right" - "Lawdy, Miss Clawdy" - "Mystery Train" - "Playing For Keeps" - "Poor Boy" - "My Baby Left Me" - "I Was The One" - "Shake, Rattle & Roll" - "I'm Left, You're Right, She's Gone" - "You're A Heartbreaker"
Tracks: "Blue Moon Of Kentucky" - "Young And Beautiful" - "Baby, I Don't Care" - "Milk Cow Blues" - "Baby Let's Play House" - "Good Rockin' Tonight" - "Is It So Strange" - "We're Gonna Move" - "I Want To Be Free" - "I Forgot To Remember To Forget"
Tracks: "I Need Your Love Tonight" - "Don't" - "Wear My Ring Around Your Neck" - "My Wish Came True" - "I Got Stung" - "One Night" - "A Big Hunk O' Love" - "I Beg Of You" - "A Fool Such As I" - "Doncha' Think It's TIme"
Tracks: "Make Me Know It" - "Fever" - "The Girl Of My Best Friend" - "I Will Be Home Again" - "Dirty, Dirty Feeling" - "Thrill Of Your Love" - "Soldier Boy" - "Such A Night" - "It Feels So Right" - "Girl Next Door Went A' Walking" - "Like A Baby" - "Reconsider Baby"
Tracks: "Tonight Is So Right For Love" - "What's She Really Like" - "Frankfort Special" - "Wooden Heart" - "G.I. Blues" - "Pocketful Of Rainbows" - "Shoppin' Around" - "Big Boots" - "Didja Ever" - "Blue Suede Shoes" - "Doin' The Best I Can" - "Tonight's All Right For Love"
Tracks: "His Hand In Mine" - "I'm Gonna Walk Dem Golden Stairs" - "In My Father's House" - "Milky White Way" - "Known Only To Him" - "I Believe In The Man In The Sky" - "Joshua Fit The Battle" - "He Knows Just What I Need" - "Swing Down Sweet Chariot" - "Mansion Over The Hilltop" - "If We Never Meet Again" - "Working On The Building"
Tracks: "Surrender" - "There's Always Me" - "Give Me The Night" - "It's A Sin" - "Sentimental Me" - "Starting Today" - "Gently" - "I'm Coming Home" - "In Your Arms" - "Put The Blame On Me" - "Judy" - "I Want You With Me" - "I Feel So Bad" - "(Marie's The Name) His Latest Flame" - "Little Sister" - "Good Luck Charm" - "Anything That's Part Of You" - "I Slipped, I Stumbled, I Fell"
Tracks: "Kiss Me Quick" - "Just For Old Time Sake" - "Gotta Get Back Home Somehow" - "I Met Her Today" - "(Such An) Easy Question" - "She's Not You" - "I'm Yours" - "You'll Be Gone" - "Something Blue" - "Suspicion" - "I Fell That I've Known You Forever" - "Night Rider" - "For The Millionth And Last Time" - "Just Tell Her Jim Said Hello" - "Fountain Of Love" - "That's Someone You Never Forget" - "Steppin' Out Of Line"
Tracks: "Beyond The Bend" - "Relax" - "Take Me To The Fair" - "They Remind Me Too Much Of You" - "One Broken Heart For Sale" (Movie Version) - "I'm Falling In Love Tonight" - "Cotton Candy Land" - "A World Of Our Own" - "How Would You Like To Be" - "Happy Ending" - "One Broken Heart For Sale"
Tracks: "It's Now Or Never" - "Stuck On You" - "Fame And Fortune" - "I Gotta Know" - "Surrender" - "I Feel So Bad" - "Are You Lonesome Tonight?" - "(Marie's The Name) His Latest Flame" - "Little Sister" - "Good Luck Charm" - "Anything That's Part Of You" - "She's Not You" - "Wild In The Country" - "Wooden Heart" - "Girl Of My Best Friend" - "Follow That Dream" - "King Of The Whole World" - "Can't Help Falling In Love"
Tracks: - "Fun In Acapulco" - "Vino Dinero y Amor" - "Mexico" - "Toro" - "Marguerita" - "Bullfighter Was A Lady" - "(There's) No Room To Rhumba In A Sports Car" - "I Think I'm Gonna Like It Here" - "Bossa Nova Baby" - "You Can't Say No In Acapulco" - "Guadalajara"
Tracks: "Kissin' Cousins" (Number 2) - "Smokey Moutain Boy" - "There's Gold In The Mountains" - "One Boy Two Little Girls" - "Catchin' On Fast" - "Tender Feeling" - "Anyone (Could Fall In Love With You)" - "Barefoot Ballad" - "Once Is Enough" - "Kissin' Cousins"
Tracks: "Viva Las Vegas" - "If You Think I Don't Need You" - "I Need Somebody To Lean On" - "Your'e The Boss" - "What'd I Say" - "Do The Vega" - "C'mon Everybody" - "The Lady Loves Me" - "Night Life" - "Today, Tomorrow And Forever" - "The Yellow Rose Of Texas" - "Santa Lucia" - "Roustabout" - "Little Egypt" - "Poison Ivy League" - "Hard Knocks" - "It's A Wonderful World" - "Big Love Big Heartache" - "One Track Heart" - "It's Carnival Time" - "Carny Town" - "There's A Brand New Day On The Horizon" - "Wheels On My Heels"
Tracks: "Girl Happy" - "Spring Fever" - "Fort Lauderdale Chamber Of Commerce" - "Startin' Tonight" - "Wolf Call" - "Do Not Disturb" - "Cross My Heart And Hope To Die" - "The Meaniest Girl In Town" - "Do The Clam" - "Puppet On A String" - "I've Got To Find My Baby"
Tracks: "Your Cheatin' Heart" - "Summer Kisses, Winter Tears" - "Finders Keepers" - "In My Way" - "Tomorrow Night" - "Memphis, Tennessee" - "For The Millionth And The Last Time" - "Forget Me Never" - "Sound Advice" - "Santa Lucia" - "I Met Her Today" - "When It Rains, It Really Pours"
Tracks: "Harem Holiday" - "My Desert Serenade" - "Go East Young Man" - "Mirage" - "Kismet" - "Shake That Tambourine" - "Hey Little Girl" - "Golden Coins" - "So Close, Yet So Far" - "Animal Instinct" - "Wisdom Of The Ages"
Tracks: "Frankie And Johnny" - "Come Along" - "Petunia, The Gardener's Daughter" - "Chesay" - "What Every Woman Lives For" - "Look Out, Broadway" - "Beginner's Luck" - "Down By The Riverside" - "Shout It Out" - "Hard Luck" - "Please Don't Stop Loving Me" - "Everybody Come Aboard"
Tracks: "Paradise, Hawaiin Style" - "Queenie Wahine's Papaya" - "Scratch My Back" - "Drums Of The Islands" - "Datin'" - "A Dog's Life" - "House Of Sand" - "Stop Where You Are" - "This Is My Heaven" - "Sand Castles"
Tracks: "Stop, Look And Listen" - "Adam And Evil" - "All That I Am" - "Never Say Yes" - "Am I Ready" - "Beach Shack" - "Spinout" - "Smorgasbord" - "I'll Be Back"
Tracks: "How Great Thou Art" - "In The Garden" - "Somebody Bigger Than You And I" - "Farther Along" - "Stand By Me" - "Without Him" - "So High" - "Where Could I Go But To The Lord" - "By And By" - "If The Lord Wasn't Walking By My Side" - "Run On" - "Where No One Stands Alone" - "Crying In The Chapel"
Tracks: "Double Trouble" - "Baby, If You'll Give Me All Of Your Love" - "Could I Fall In Love" - "Long Legged Girl (With The Short Dress On)" - "City By Night" - "Old MacDonald" - "I Love Only One Girl" - "There Is So Much World To See" - "It Won't Be Long"
Tracks: "Clambake" - "Who Needs Money?" - "A House That Has Everything" - "Confidence" - "Hey, Hey, Hey" - "You Don't Know Me" - "The Girl I Never Loved" - "How Can You Lose What You Never Had" - "Clambake" (Reprise) - "Stay Away, Joe" - "Dominic" - "All I Needed Was The Rain" - "Goin' Home" - "Stay Away"
Tracks: "Return To Sender" - "Rock-A-Hula Baby" - "Love Letters" - "Bossa Nova Baby" - "Witchcraft" - "Kissin' Cousins" - "It Hurts Me" - "Viva Las Vegas" - "What'd I Say" - "Please Don't Drag That String Around" - "Indescribably Blue" - "(You're The) Devil In Disguise" - "Lonely Man" - "Mess Of Blues" - "Ask Me" - "Ain't That Loving You Baby" - "Just Tell Her Jim Said Hello" - "Crying In The Chapel"
Tracks: "Easy Come Easy Go" - "The Love Machine" - "Yoga Is As Yoga Does" - "You Gotta Stop" - "Sing You Children" - "I'll Take Love" - "She's A Machine" - "The Love Machine" (Alternate Take 1) ** - "Sing You Children" (Alternate Take 1) ** - "She's A Machine" (Alternate Take 13) ** - "Suppose" (Alternate Master) ** - "Speedway" - "There Ain't Nothing Like A Song" - "Your Time Hasn't Come Yet Baby" - "Who Are You (Who Am I)" - "He's Your Uncle Not Your Dad" - "Let Yourself Go" - "Five Sleepy Heads" - "Suppose" - "Your Groovy Self"
Live Tracks: "Trouble / Guitar Man" - "Heartbreak Hotel" - "Hound Dog" - "All Shook Up" - "Can't Help Falling In Love" - "Jailhouse Rock" - "Don't Be Cruel" - "Blue Suede Shoes" - "Love Me Tender" - "Baby, What You Want Me To Do" - "Trouble / Guitar Man" - "Sometimes I Feel Like A Motherless Child / Where Could I Go" - "Memories" - "Little Less Conversation" - "Nothingville / Big Boss Man / Let Yourself Go / It Hurts Me" - "If I Can Dream" - "When It Rains, It Really Pours" - "Lawdy Miss Clawdy" - "Baby What You Want Me To Do" - "That's All Right" - "Heartbreak Hotel" - "Love Me" - "Baby What You Want Me To Do" - "Blue Suede Shoes" - "Baby What You Want Me To Do" - "Lawdy Miss Clawdy" - "Are You Lonesome Tonight?" - "When My Blue Moon Turns To Gold Again" - "Blue Christmas" - "Trying To Get To You" - "One Night" - "Baby What You Want Me To Do" - "One Night" - "Memories" - "If I Can Dream"
Tracks: "Flaming Star" - "Summer Kisses Winter Tears" - "Britches" - "A Cane And A High Starched Collar" - "Black Star" - "Summer Kisses" ** - Flaming Star" (End Title Version) ** - Wild In The Country" - "I Slipped I Stumbled I Fell" - "Lonely Man" - "In My Way" - "Forget Me Never" - "Lonely Man" - "I Slipped I Stumbled I Fell" (Alternate Master) ** - "Follow That Dream" - "Angel" - "What A Wonderful Life" - "I'm Not The Marrying Kind" - "A Whistling Tune" - "Sound Advice"
Live Tracks: "Blue Suede Shoes" - "Johnny B. Goode" - "All Shook Up" - "Are You Lonesome Tonight?" - "Hound Dog" - "I Can't Stop Loving You" - "My Babe" - "Mystery Train / Tiger Man" - "Words" - "In The Ghetto" - "Suspicious Minds" - "Can't Help Falling In Love"
Tracks: "Stay Away Joe" - "If I'm A Fool" - "Let's Be Friends" - "Let's Forget About The Stars" - "Mama" - "I'll Be There" - "Almost" - "Change Of Habit" - "Have A Happy"
Live Tracks: "See See Rider" - "Release Me (And Let Me Love Again)" - "Sweet Caroline" - "Runaway" - "The Wonder Of You" - "Polk Salad Annie" - "Yesterday" - "Proud Mary" - "Walk A Mile In My Shoes" - "Let It Be Me"
Tracks: "Heartbreak Hotel" - "I Was The One" - "I Want You, I Need You, I Love You" - "Hound Dog" - "Don't Be Cruel" - "Any Way You Want Me" - "Love Me Tender" - "Playing For Keeps" - "Too Much" - "All Shook Up" - "That's When Your Heartaches Begin" - "I Beg Of You" - "Loving You" - "(Let Me Be Your) Teddy Bear" - "Jailhouse Rock" - "Treat Me Nice" - "Don't" - "Hard Headed Woman" - "Wear My Ring Around Your Neck" - "A Big Hunk O' Love" - "Ain't That Loving You Baby" - "(Now And Then There's) A Fool Such As I" - "I Got Stung" - "Crying In The Chapel" - "Viva Las Vegas" - "I Gotta Know" - "Are You Lonesome Tonight" - "Rock-A-Hula Baby" - "I Feel So Bad" - "Little Sister" - "Return To Sender" - "Can't Help Falling In Love" - "Good Luck Charm" - "She's Not You" - "Surrender" - "Anything That's Part Of You" - "Where Do You Come From" - "One Broken Heart FOr Sale" - "Crying In The Chapel" - "In The Ghetto" - "Kentucky Rain"
Tracks: "Almost In Love" - "Long Legged Girl" - "Edge Of Reality" - "My Little Friend" - "A Little Less Conversation" - "Rubberneckin'" - "Clean Up Your Own Back Yard" - "U.S. Male" - "Charro" - "Stay Away"
Tracks: "Inherit The Wind" - "This Is The Story" - "Stranger In My Own Home Town" - "A Little Bit Of Green" - "And The Grass Won't Pay No Mind" - "Do You Know Who I Am?" - "From A Jack To A King" - "The Fair's Moving On" - "You'll Think Of Me" - "Without Love (There Is Nothing)"
Live Tracks: "I Just Can't Help Believin'" - "Twenty Days And Twenty Nights" - "How The Web Was Woven" - "Patch It Up" - "Mary In The Morning" - "You Don't Have To Say You Love Me" - "You've Lost That Lovin' Feelin'" - "I've Lost You" - "Just Pretend" - "Stranger In The Crowd" - "The Next Step Is Love" - "Bridge Over Troubled Water"
Tracks: "Snowbird" - "Tomorrow Never Comes" - "Little Cabin On The Hill" - "Whole Lot-Ta Shakin' Goin' On" - "Funny How Time Slips Away" - "There Goes My Everything" - "It's Your Baby, Rock It" - "Fool" - "Faded Love" - "I Washed My Hands In Muddy Water" - "Make The World Go Away"
Tracks: "You'll Never Walk Alone" - "Who Am I?" - "Let Us Pray" - "Peace In The Valley" - "We Call On Him" - "I Believe" - "It Is No Secret (What God Can Do)" - "Sing You Children" - "Take My Hand Precious Lord"
Tracks: "Love Letters" - "When I'm Over You" - "If I Were You" - "Got My Mojo Working" - "Heart Of Rome" - "Only Believe" - "This Is Our Dance" - "Cindy, Cindy" - "I'll Never Know" - "It Ain't No Big Thing (But It's Growing)" - "Life"
Tracks: "My Baby Left Me" - "Trouble" - "We're Gonna Move" - "Young Dreams" - "Doncha' Think It's Time" - "Poor Baby" - "I Need Your Love Tonight" - "Let Me" - "Fame And Fortune" - "Love Me" - "I Believe In The Man In The Sky" - "Paralyzed" - "Lonely Man" - "When My Blue Moon Turns To Gold Again" - "Rip It Up" - "Wild In The Country" - "His Latest Flame" - "Tell Me Why" - "Got A Lot O' Living To Do" - "Just Tell Her Jim Said Hello" - "Mean Woman Blues" - "They Remind Me Too Much Of You" - "Hot Dog" - "Please Don't Drag That String Around" - "Lonesome Cowboy" - "Witchcraft" - "Ask Me" - "One Night" - "It Hurts Me" - "Young And Beautiful" - "I Want To Be Free" - "Puppet On A String" - "Any Day Now" - "(You're So Square) Baby I Don't Care" - "My Wish Came True" - "You'll Think Of Me" - "Dixieland Rock" - "The Wonder Of You" - "I've Lost You" - "Lover Doll" - "New Orleans" - "The Next Step Is Love" - "Don't Ask Me Why" - "You Don't Have To Say You Love Me" - "Crawfish" - "Patch It Up" - "King Creole" - "There Goes My Everything" - "As Long As I Have You" - "I Really Don't Want To Know"
Tracks: "I Got Lucky" - "What A Wonderful World" - "I Need Somebody To Lean On" - "Yoga Is As Yoga Does" - "Riding The Rainbow" - "Fools Fall In Love" - "The Love Machine" - "Home Is Where The Heart Is" - "You Gotta Stop" - "If You Think I Don't Need You"
Tracks: "O Come, All Ye Faithful" - "The First Noel" - "On A Snowy Christmas Night" - "Winter Wonderland" - "The Wonderful World Of Christmas" - "It Won't Seem Like Christmas (Without You)" - "I'll Be Home On Christmas Day" - "If I Get Home On Christmas Day" - "Holly Leaves And Christmas Trees" - "Merry Christmas Baby" - "Silver Bells" - "Blue Christmas"
Tracks: "Help Me Make It Through The Night" - "Miracle Of The Rosary" - "Hey Jude" - "Put Your Hand In The Hand" - "Until It's Time For You To Go" - "We Can Make The Morning" - "Early Mornin' Rain" - "Sylvia" - "Fools Rush In(Where Angels Fear To Tread)" - "I Was Born About Ten Thousand Years Ago"
Tracks: "He Touched Me" - "I've Got Confidence" - "Amazing Grace - The Nashville Edition" - "Seeing Is Believing" - "He Is My Everything" - "Bosom Of Abraham" - "Evening Prayer" - "Lead Me, Guide Me" - "There Is No God But God" - "Thing Called Love" - "I, John" - "Reach Out To Jesus"
Live Tracks: "Also Sprach Zarathustra" - "That's All Right" - "Proud Mary" - "Never Been To Spain" - "You Don't Have To Say You Love Me" - "You've Lost That Lovin' Feelin'" - "Polk Salad Annie" - "Love Me" - "All Shook Up" - "Heartbreak Hotel" - "(Let Me Be Your) Teddy Bear / Don't Be Cruel" - "Love Me Tender" - "Impossible Dream (The Quest)" - "Hound Dog" - "Suspicious Minds" - "For The Good Times" - "American Trilogy" - "Funny How Time Slips Away" - "I Can't Stop Lovin' You" - "Can't Help Falling In Love" - "End Theme"
Tracks: "Down By The Riverside / When The Saints Go Marching In" - "They Remind Me Too Much Of You" - "Confidence" - "Frankie & Johnny" - "Guitar Man" - "Long Legged Girl (With A Short Dress On)" - "You Don't Know Me" - "How Would You Like To Be?" - "Big Boss Man" - "Old MacDonald"
Tracks: "Burning Love" - "Tender Feeling" - "Am I Ready" - "Tonight Is So Right For Love" - "Guadalajara" - "It's A Matter Of Time" - "No More" - "Santa Lucia" - "We'll Be Together" - "I Love Only One Girl"
Tracks: "Separate Ways" - "Sentimental Me" - "In My Way" - "I Met Her Today" - "What Now, What Next, Where To" - "Always On My Mind" - "I Slipped, I Stumbled, I Fell" - "Is It So Strange" - "Forget Me Never" - "Old Shep"
Live Tracks: "See See Rider" - "That's All Right" - "Proud Mary" - "Never Been To Spain" - "You Don't Have To Say You Love Me" - "You've Lost That Lovin' Feelin'" - "Polk Salad Annie" - "Love Me" - "All Shook Up" - "Heartbreak Hotel" - "Medley" - "(Let Me Be Your) Teddy Bear" - "Don't Be Cruel" - "Love Me Tender" - "Impossible Dream (The Quest)" - "Hound Dog" - "Suspicious Minds" - "For The Good Times" - "American Trilogy" - "Funny How Time Slips Away" - "I Can't Stop Loving You" - "Can't Help Falling In Love"
Tracks: "Fool" - "Where Do I Go From Here" - "Love Me, Love The Life I Lead" - "It's Still Here" - "It's Impossible" (live) - "For Lovin' Me, (That's What You Get)" - "Padre" - "I'll Take You Home Again Kathleen" - "I Will Be True" - "Don't Think Twice, It's All Right"
Tracks: "Raised On Rock" - "Are You Sincere" - "Find Out What's Happening" - "I Miss You" - "Girl Of Mine" - "For Ol' Times Sake" - "If You Don't Come Back" - "Just A Little Bit" - "Sweet Angeline" - "Three Corn Patches"
Tracks: "That's All Right" - "Heartbreak Hotel" - "Don't Be Cruel" - "Trying To Get To You" - "Love Me Tender" - "(There'll Be) Peace In The Valley (For Me)" - "Tonight's All Right For Love" - "Can't Help Falling In Love"
Tracks: Take Good Care Of Her"" - "Loving Arms" - " I Got A Feelin' In My Body" - "If That Isn't Love" - "She Wears My Ring" - "I've Got A Thing About You Baby" - "My Boy" - "Spanish Eyes" - "Talk About The Good Times" - "Good Time Charlie's Got The Blues"
Live Tracks: "See See Rider" - "I Got A Woman" - "Love Me" - "Trying To Get To You" - "Long Tall Sally / Whole Lotta Shakin' Goin' On / Mama Don't Dance / Flip Flop And Fly / Jailhouse Rock / Hound Dog" - "Why Me Lord" - "How Great Thou Art" - "Blueberry Hill / I Can't Stop Loving You" - "Help Me" - "An American Trilogy" - "Let Me Be There" - "My Baby Left Me" - "Lawdy Miss Clawdy" - "Can't Help Falling In Love" - "Closing (Vamp)"
Tracks: "Promised Land" - "There's A Honky Tonk Angel" - "Help Me" - "Mr. Songman" - "Love Song Of The Year" - "It's Midnight" - "Your Love's Been A Long Time Coming" - "If You Talk In Your Sleep" - "Thinking About You" - "You Asked Me To"
Tracks: "T-R-O-U-B-L-E" - "And I Love You So" - "Susan When She Tried" - "Woman Without Love" - "Shake A Hand" - "Pieces Of My Life" - "Fairytale" - "I Can Help" - "Bringin' It Back" - "Green, Green Grass Of Home"
Tracks: "Harbor Lights" - "I Want You, I Need You, I Love You" - "Blue Hawaii" - "Jailhouse Rock" - "It's Now Or Never" - "Blue Suede Shoes" - "Such A Night" - "Baby What You Want Me To Do" - "How Great Thou Art" - "If I Can Dream"
Tracks: "Hurt" - "Never Again" - "Blue Eyes Crying In The Rain" - "Danny Boy" - "Last Farewell" - "For The Heart" - "Bitter They Are, Harder They Fall" - "Solitaire" - "Love Coming Down" - "I'll Never Fall In Love Again"
Tracks: "Welcome To My World" - "Help Me Make It Through The Night" - "Release Me (And Let Me Love Again)" - "I Really Don't Want To Know" - "For The Good Times" - "Make The World Go Away" - "Gentle On My Mind" - "I'm So Lonesome I Could Cry" - "Your Cheatin' Heart" - "I Can't Stop Loving You"
Live Tracks: "Also Sprach Zarathustra" - "See See Rider" - "That's All Right" - "Are You Lonesome Tonight?" - "(Let Me Be Your) Teddy Bear / Don't Be Cruel" - "You Gave Me A Mountain" - "Jailhouse Rock" - "How Great Thou Art" - "I Really Don't Want To Know" - "Hurt" - "Hound Dog" - "My Way" - "Can't Help Falling In Love" - "I Got A Woman / Amen" - "Love Me" - "If You Love Me (Let Me Know)" - "O Sole Mio / It's Now Or Never" - "Trying To Get To You" - "Hawaiian Wedding Song" - "Fairytale" - "Little Sister" - "Early Morning Rain" - "What'd I Say" - "Johnny B. Goode" - "And I Love You So"
Tracks: "He Is My Everything" - "Miracle Of The Rosary" - "Where Did They Go, Lord" - "Somebody Bigger Than You And I" - "An Evening Prayer" - "The Impossible Dream" - "If I Can Dream" - "Padre" - "Known Only To Him" - "Who Am I?" - "How Great Thou Art"
Tracks: "Teddy Bear" - "Wooden Heart" - "Five Sleepyheads" - "Puppet On A String" - "Angel" - "Old MacDonald" - "How Would You Like To Be" - "Cotton Candy Land" - "Old Shep" - "Have A Happy"
Live Tracks: "Intro/Jailhouse Rock" - "(Let Me Be Your) Teddy Bear" - "All Shook Up" - "Loving You" - "Until It's Time For You To Go" - "Early Morning Rain" - "I'm Movin' On" - "Snowbird" - "(That's What You Get) For Lovin' Me" - "Put Your Hand In The Hand" - "Little Darlin'" - "Beyond The Reef" - "My Heart Cries For You" - "Tumblin' Tumbleweeds" - "My Way"
Tracks: "Hound Dog" - "Danny" - "Fame And Fortune" - "Frankfurt Special" - "Britches" - "Crying In The Chapel" - "Surrender" - "Guadalajara" - "It Hurts Me" - "Let Yourself Go" - "In The Ghetto" - "Let It Be Me"
Tracks: "Are You Sincere" - "It's Midnight" - "My Boy" - "Girl Of Mine" - "Take Good Care Of Her" - "I'll Never Fall In Love Again" - "Your Love's Been A Long Time Coming" - "Spanish Eyes" - "Never Again" - "She Thinks I Still Care" - "Solitaire"
Tracks: "I Got A Feelin' in My Body" - "Green Green Grass Of Home" - "For The Heart" - "She Wears My Ring" - "I Can Help" - "Way Down" - "There's A Honky Tonk Angel (Who Will Take Me Back In)" - "Find Out What's Happening" - "Thinking About You" - "Don't Think Twice It's All Right"
Tracks: "Heartbreak Hotel" - "Long Tall Sally" - "Blue Suede Shoes" - "Money Honey" - "Heartbreak Hotel" - "All Shook Up" - "(Now And Then There's) A Fool Such As I" - "I Got A Woman" - "Love Me" - "Such A Night" - "Reconsider Baby" - "I Need Your Love Tonight" - "That's All Right, Mama" - "Don't Be Cruel" - "One Night" - "Are You Lonesome Tonight?" - "It's Now Or Never" - "Swing Down Sweet Chariot" - "Hound Dog" - "They Remind Me Too Much Of You" - "Tonight Is So Right For Love" - "Follow That Dream" - "Wild In The Country" - "Datin'" - "Shoppin' Around" - "Can't Help Falling In Love" - "A Dog's Life" - "I'm Falling In Love Tonight" - "Thanks To The Rolling Sea" - "Jailhouse Rock" - "Suspicious Minds" - "Lawdy Miss Clawdy / Baby What You Want Me To Do" - "Blue Christmas" - "You Gave Me A Mountain" - "Welcome To My World" - "Tryin' To Get To You" - "I'll Remember You" - "My Way" - "Polk Salad Annie" - "You've Lost That Lovin' Feelin'" - "Sweet Caroline" - "Kentucky Rain" - "Are You Lonesoome Tonight?" - "My Babe" - "In The Ghetto" - "An American Trilogy" - "Little Sister / Get Back" - "Yesterday" - "I'm Leavin'" - "The First Time Ever I Saw Your Face" - "High Heel Sneakers" - "Softly As I Leave You" - "Unchained Melody" - "Fool" - "Rags To Riches" - "It's Only Love" - "America The Beautiful" - "I'm Still Here" - "I'll Take You Home Again Kathleen" - "Beyond The Reef" - "I Will Be True" - "Also Sprach Zarathustra" - "See See Rider" - "I Got A Woman / Amen" - "Love Me" - "If You Love Me (Let Me Know)" - "Love Me Tender" - "All Shook Up" - "Teddy Bear / Don't Be Cruel" - "Hound Dog" - "The Wonder Of You" - "Burning Love" - "Long Live Rock And Roll" - "T-R-O-U-B-L-E" - "Why Me Lord" - "How Great Thou Art" - "An American Triology" - "Funny How Time Slips Away" - "Little Darlin'" - "Mystery Train / Tiger Man" - "Can't Help Falling In Love"
Tracks: "Guitar Man" - "After Loving You" - "Too Much Monkey Business" - "Just Call Me Lonesome" - "Lovin' Arms" - "You Asked Me To" - "Clean Up Your Own Backyard" - "She Thinks I Still Care" - "Faded Love" - "I'm Movin' On"
Tracks: "His Latest Flame (Marie's The Name)" - "Moody Blue" - "That's All Right" - "Shake, Rattle And Roll" - "Flip, Flop And Fly" - "Heartbreak Hotel" - "Hound Dog" - "My Baby Left Me" - "Merry Christmas Baby" - "Mean Woman Blues" - "Don't Be Cruel" - "Teddy Bear" - "Jailhouse Rock" - "G.I. Blues" - "Too Much Monkey Business" - "Love Me Tender" - "I've Got A Thing About You Baby" - "I Need Your Love Tonight" - "Blue Suede Shoes" - "Viva Las Vegas" - "Suspicious Minds" - "Promised Land" - "Always On My Mind" - "Are You Lonesome Tonight" - "My Way" - "An American Trilogy" - "Memories"
Tracks: "The Wonder Of You" - "A Big Hunk O' Love" - "There Goes My Everything" - "Suspicious Minds" - "What'd I Say" - "Don't Cry Daddy" - "Steamroller Blues" - "The Sound Of Your Cry" - "Burning Love" - "You'll Never Walk Alone"
Tracks: "Kentucky Rain" - "Fever" - "It's Impossible" - "Jailhouse Rock" - "Don't Be Cruel" - "I Got A Woman" - "All Shook Up" - "Loving You" - "In The Ghetto" - "Love Me Tender"
Tracks: "That's All Right Mama" - "Heartbreak Hotel" - "Long Tall Sally" - "I Was The One" - "I Got A Woman" - "Blue Suede Shoes" - "Hound Dog" - "Baby Let's Play House" - "Maybellene" - "Tweedle Dee" - "Blue Moon Of Kentucky" - "Money Honey"
Live & Alternate Tracks: "Harbor Lights" - "That's Alright" - "Blue Moon Of Kentucky" - "I Don't Care If The Sun Don't Shine" - "I'm Left, You're Right, She's Gone" - "I'll Never Let You Go" - "When It Rains, It Really Pours" - "Shake, Rattle & Roll/Flip, Flop & Fly" - "I Got A Woman" - "Baby, Let's Play House" - "Tuttie Frutti" - "Blue Suede Shoes" - "Heartbreak Hotel" - "Tutti Frutti" - "I Was The One" - "Blue Suede Shoes" - "Heartbreak Hotel" - "Money Honey" - "Heartbreak Hotel" - "Blue Suede Shoes" - "Hound Dog" - "I Want You, I Need You, I Love You" - "Hound Dog" - "Heartbreak Hotel" - "Long Tall Sally" - "I Was The One" - "I Want You, I Need You, I Love You" - "I Got A Woman" - "Don't Be Cruel" - "Ready Teddy" - "Love Me Tender" - "Hound Dog" - "Love Me Tender" - "I Was The One" - "I Got A Woman" - "Blue Suede Shoes" - "Baby, Let's Play House" - "Hound Dog" - "Don't Be Cruel" - "Love Me Tender" - "Ready Teddy" - "Hound Dog" - "Don't Be Cruel" - "Love Me Tender" - "Love Me" - "Hound Dog" - "Hound Dog" - "Love Me Tender" - "Heartbreak Hotel" - "Don't Be Cruel" - "Too Much" - "When My Blue Moon Turns To Gold Again" - "Danny Boy" - "Soldier Boy" - "The Fool" - "Earth Angel" - "I Asked The Lord (He's Only A PRayer Away)" - "My Heart Cries For You" - "Dark Moon" - "Write To Me From Naples" - "Suppose" - "Blue Suede Shoes" - "Tiger Man" - "That's All Right" - "Lawdy Miss Clawdy" - "Baby What You Want Me To Do" - "Love Me" - "Baby What You Want Me To Do" - "Blue Christmas" - "One Night" - "Trying To Get To You"
Tracks: "Lawdy Miss Clawdy" - "Hound Dog" - "Blue Suede Shoes" - "(You're So Square) Baby I Don't Care" - "I Got A Woman" - "Long Tall Sally" - "Money Honey" - "Rip It Up" - "Tutti Frutti" - "Reddy Teddy" - "Shake, Rattle & Roll" - "Jailhouse Rock"
Tracks: "Are You Lonesome Tonight" - "I Need Somebody To Lean On" - "Young And Beautiful" - "Playing For Keeps" - "Tell Me Why" - "Give Me The Right" - "It Feels So Right" - "I Was The One" - "Fever" - "Tomorrow Is A Long Time" - "Love Letters" - "Fame And Fortune" - "Can't Help Falling In Love"
Tracks: "Heartbreak Hotel" - "I Want You, I Need You, I Love You" - "Hound Dog" - " Don't Be Cruel" - "Love Me Tender" - "Too Much" - "All Shook Up" - "Teddy Bear" - "Jailhouse Rock" - "Don't" - "Hard Headed Woman" - "A Big Hunk O' Love" - "Stuck On You" - "It's Now Or Never" - "Are You Lonesome Tonight?" - "Surrender" - "Good Luck Charm" - "Suspicious Minds"
Tracks: "Heartbreak Hotel" - "I Want You, I Need You, I Love You" - "Hound Dog" - "Don't Be Cruel" - "Love Me Tender" - "Love Me" - "Too Much" - "All Shook Up" - "(Let Me be Your) Teddy Bear" - "Don't" - "I Beg Of You" - "Wear My Ring Around Your Neck" - "One Night" - "I Got Stung" - "(Now And Then There's) A Fool Such As I" - "I Need Your Love Tonight" - "A Big Hunk O' Love" - "Stuck On You" - "It's Now Or Never" - "Surrender" - "I Feel So Bad" - "Little Sister" - "(Marie's The Name Of) His Latest Flame" - "Can't Help Falling In Love With You" - "Good Luck Charm" - "She's Not You" - "Return To Sender" - "(You're The) Devil In Disguise" - "Bossa Nova Baby" - "Crying In The Chapel" - "In The Ghetto" - "Suspicious Minds" - "Don't Cry Daddy" - "The Wonder Of You" - "Burning Love"
Tracks: "Just A Little Walk With Jesus" - "Walk That Lonesome Valley" - "I Shall Not Be Moved" - "Peace In The Valley" - "Down By The Riverside" - "I'm With The Crowd But Oh So Alone" - "Farther Along" - "Blessed Jesus (Hold My Hand)" - "As We Travel Along The Jericho Road" - "I Just Can't Make It By Myself" - "Little Cabin On The Hill" - "Summertime Has Passed And Gone" - "I Hear A Sweet Voice Calling" - "And Now Sweetheart" - "You've Done Me Wrong" - "Keeper Of The Key" - "Crazy Arms" - "Don't Forbid Me"
Tracks: "O Come All Ye Faithful" - "First Noel" - "Winter Wonderland" - "Silver Bells" - "Blue Christmas" - "Silent Night" - "White Christmas" - "I'll Be Home For Christmas"
Tracks: "I Believe" - "(There'll Be) Peace In The Valley (For Me)" - "Take My Hand, Precious Lord" - "It Is No Secret (What God Can Do)" - "Milky White Way" - "His Hand In Mine" - "I Believe In The Man In The Sky" - "He Knows Just What I Need" - "Mansion Over The Hilltop" - "In My Father's House" - "Joshua Fit The Battle" - "Swing Down Sweet Chariot" - "I'm Gonna Walk Dem Golden Stairs" - "If We Never Meet Again" - "Known Only To Him" - "Working On The Building" - "Crying In The Chapel" - "Run On" - "How Great Thou Art" - "Stand By Me" - "Where No One Stands Alone" - "So High" - "Farther Along" - "By And By" - "in The Garden" - "Somebody Bigger Than You And I" - "Without Him" - "If The Lord Wasn't Walking By My Side" - "Where Could I Go But To The Lord" - "We Call On Him" - "You'll Never Walk Alone" - "Only Believe" - "Amazing Grace" - "Miracle Of The Rosary" - "Lead Me, Guide Me" - "He Touched Me" - "I've Got Confidence" - "Evening Prayer" - "Seeing Is Believing" - "Thing Called Love" - "Put Your Hand In The Hand" - "Reach Out To Jesus" - "He Is My Everything" - "There Is No God But God" - "I, John" - "Bosom Of Abraham" - "Help Me" - "If That Isn't Love" - "Why Me Lord?" (live) - "How Great Thou Art" (live) - "I, John" - "You Better Run" - "Lead Me, Guide Me" - "Turn Your Eyes Upon Jesus / Nearer My God To Thee"
Tracks: "If Every Day Was Like Christmas" - "Blue Christmas" - "Here Comes Santa Claus" - "White Christmas" - "Santa Bring My Baby Back (To Me)" - "I'll Be Home For Christmas" - "O Little Town Of Bethlehem" - "Santa Claus Is Back In Town" - "It Won't Seem Like Christmas (Without You)" - "If I Get Home On Christmas Day" - "Holly Leaves And Christmas Trees" - "Merry Christmas Baby" - "Silver Bells" - "I'll Be Home On Christmas Day" (Alternate Version) - "On A Snowy Christmas Night" - "Winter Wonderland" - "The Wonderful World Of Christmas" - "O Come All Ye Faithful" - "The First Noel" - "It Won't Seem Like Christmas" - "Silver Bells" - "Holly Leaves And Christmas Trees" - "I'll Be Home On Christmas Day" - "Christmas Message From Elvis / Silent Night"
Tracks: "The Wonder Of You" - "I've Lost You" - "The Next Step Is Love" - "You Don't Have To Say You Love Me" - "Patch It Up" - "I Really Don't Want To Know" - "There Goes My Everything" - "Rags To Riches" - "Where Did They Go, Lord" - "Life" - "I'm Leavin'" - "Heart Of Rome" - "It's Only Love" - "The Sound Of Your Cry" - "I Just Can't Help Believin'" - "How The Web Was Woven" - "Until It's Time For You To Go" - "We Can Make The Morning" - "An American Trilogy" - "The First Time Ever I Saw Your Face" - "Burning Love" - "It's A Matter Of Time" - "Separate Ways" - "Always On My Mind" - "Fool" - "Steamroller Blues" - "Raised On Rock" - "For Ol' Times Sake" - "I've Got A Thing About You Baby" - "Take Good Care Of Her" - "If You Could Talk In Your Sleep" - "Promised Land" - "It's Midnight" - "My Boy" - "Loving Arms" - "T-R-O-U-B-L-E" - "Mr. Songman" - "Bringing It Back" - "Pieces Of My Life" - "Green, Green Grass Of Home" - "Thinking About You" - "Hurt" - "For The Heart" - "Moody Blue" - "She Thinks I Still Care" - "Way Down" - "Pledging My Love" - "Twenty Days And Twenty Nights" - "I Was Born About Ten Thousand Years Ago" - "The Fool" - "A Hundred Years From Now" - "Little, Cabin On The Hill" - "Cindy, Cindy" - "Bridge Over Troubled Water" - "Get My Mojo Working / Keep Your Hands Off Of It" - "It's Your Baby, You Rock It" - "Stranger In The Crowd" - "Mary In The Morning" - "It Ain't No Big Thing" - "Just Pretend" - "Faded Love" - "Tomorrow Never Comes" - "Make The World Go Away" - "Funny How Time Slips Away" - "I Washed My Hands In Muddy Water" - "Snowbird" - "Whole Lot-Ta Shakin' Goin' On" - "Amazing Grace" - "(That's What you Get) For Lovin' Me" - "Lady Madonna" - "Merry Christmas Baby" - "I Shall Be Released" - "Don't Think Twice, It's All Right" - "It's Still Here" - "I'll Take You Home Again Kathleen" - "I Will Be True" - "My Way" - "For The Good Times" - "Just A Little Bit" - "It's Diff'rent Now" - "Are You Sincere" - "I Got A Feelin' In My Body" - "You Asked Me To" - "Good Time Charlie's Got The Blues" - "Talk About The Good Times" - "Tiger Man" - "I Can Help" - "Susan When She Tried" - "Shake A Hand" - "She Thinks I Still Care" - "Danny Boy" - "Love Coming Down" - "He'll Have To Go" - "See See Rider" - "Men With Broken Hearts" - "Walk A Mile In My Shoes" - "Polk Salad Annie" - "Let It Be Me (Je T' Appartiens)" - "Proud Mary" - "Something" - "You've Lost That Lovin' Feelin'" - "Heartbreak Hotel" - "I Was The One" - "One Night" - "Never Been To Spain" - "You Gave Me A Mountain" - "It's Impossible" - "A Big Hunk O' Love" - "It's Over" - "Reconsider Baby" - "I'll Remember" - "I'm So Lonesome I Could Cry" - "Suspicious Minds" - "Unchained Melody" - "The Twelfth Of Never" - "Softly As I Leave You" - " Alla' En El 'Rancho Grande" - "Froggy Went A Courtin'" - "Stranger in My Own Home Town"
Tracks: "I'll Never Stand In Your Way" - "That's All Right" (Alternate Take) - "Blue Moon" (Alternate Take) - "Good Rockin' Tonight" - "Mystery Train" - "I Got A Woman" (Alternate Take) - "Heartbreak Hotel" (Alternate Take) - "I'm Counting On You" (Alternate Take) - "Shake Rattle & Roll/Flip Flop & Fly" - "Lawdy, Miss Clawdy" (Alternate Take) - "I Want You, I Need You, I Love You" (Alternate Take) - "Hound Dog" - "Don't Be Cruel" - "Rip It Up" (Alternate Take) - "Love Me Tender" - "When The Saints Go Marching In" - "All Shook Up" - "(There'll Be) Peace In The Valley" - "(let Me Be Your) Teddy Bear" - "Jailhouse Rock" - "New Orleans" - "I Need Your Love Tonight" (Alternate Take) - "A Big Hunk O' Love" (Alternate Take) - "Bad Nauheim" - "Stuck On You" - "Fame And Fortune" - "It's Now Or Never" - "It Feels So Right" (Alternate Take) - "A Mess Of Blues" (Alternate Take) - "Are You Lonesome Tonight?" - "Reconsider Baby" - "Tonight Is So Right For Love" (Alternate Take) - "His Hand In Mine" (Alternate Take) - "Milky White Way" (Alternate Take) - "I'm Comin' Home" (Alternate Take) - "I Feel So Bad" (Alternate Take) - "Can't Help Falling In Love" - "Something Blue" (Alternate Take) - "Return To Sender" - "Bossa Nova Baby" (Alternate Take) - 'How Great Thou Art" (Alternate Take) - "Guitar Man" (Alternate Take) - "You'll Never Walk Alone" (Alternate Take) - "Oh How I Love Jesus" - "Tennessee Walktz" - "Blowin' In the Wind" - "I Can't Help It" - "I'm Beginning To Forget You" - "After Loving You" - "I Got A Woman" - "Tiger Man" - "When My Blue Moon Turns To Gold Again" - "Trying To Get To You" - "If I Can Dream" (Alternate Take) - "In The Ghetto" (Alternate Take) - "Suspicious Minds" (Alternate Take) - "Power Of My Love" (Alternate Take) - "Baby What You Want Me To Do" - "Words" - "Johnny B. Goode" - "Release Me" - See See Rider" - "The Wonder Of You" - "The Sound Of Your Cry" (Alternate Take) - "You Don't Have To Say You Love Me" - "Funny How Time Slips Away" - "I Wash My Hands In Muddy Water" - "I Was The One" - "Cattle Call" - "Baby Let's Play House" - "Don't" - "Money Honey" - "What'd I Say" - "Bridge Over Troubled Water" - "Miracle Of The Rosary" (Alternate Take) - "He Touched Me" (Alternate Take) - "Bosom Of Abraham" (Alternate Take) - "I'll Be Home On Christmas Day" (Alternate Take) - "For The Good Times" (Alternate Take) - "Burning Love" (Alternate Take) - "Separate Ways" (Alternate Take) - "Always On My Mind" (Alternate Take) - "An American Triology" - "Take Good Care Of Her" (Alternate Take) - "I've Got A Thing About You Baby" - "Are You Sincere" (Alternate Take) - "It's Midnight" (Alternate Take) - "Promised Land" (Alternate Take) - "Steamroller Blues" - "And I Love You So" (Alternate Take) - "T-R-O-U-B-L-E" - "Danny Boy" (Alternate Take) - "Moody Blue" - "Hurt" (Alternate Take) - "For The Heart" (Alternate Take) - "Pledging My Love" (Alternate Take) - "Way Down" (Alternate Take) - "My Way" - "The Jaycees Speech"
Tracks: "Good Rockin' Tonight" - "Baby Let's Play House" - "Heartbreak Hotel" - "Don't Be Cruel" - "Hound Dog" - "Too Much" - "All Shook Up" - "(Let Me Be Your) Teddy Bear" - "Jailhouse Rock" - "Hard Headed Woman" - "I Got Strung" - "Big Hunk O' Love" - "Stuck On You" - "It's Now Or Never" - "Little Sister" - "Good Luck Charm" - "She's Not You" - "Return To Sender" - "(You're The) Devil In Disguise" - "Viva Las Vegas" - "Suspicious Minds" - "Burning Love" - "Way Down"
Tracks: "If I Can Dream" - "Stuck On You" - "That's All Right" - "Good Rockin' Tonight" - "In The Ghetto" - "It's Now Or Never" - "Are You Lonesome Tonight" - "Baby Let's Play House" - "Suspicious Minds" - "Don't Cry Daddy" - "A Mess Of Blues" - "Mystery Train" - "I'll Hold You In My Heart" - "Like A Baby" - "Trying To Get To You" - "The Girl Of My Best Friend" - "Heartbreak Hotel" - "Stranger In My Own Home Town" - "After Loving You" - "Blue Suede Shoes" - "Such A Night" - "My Baby Left Me" - "Only The Strong Survive" - "Reconsider Baby" - "Lawdy Miss Clawdy" - "Surrender" - "The Wonder Of You" - "Can't Help Falling In Love" - "Hound Dog" - "Polk Salad Annie" - "Any Way You Want Me (That's How I Will Be)" - "I've Lost You" - "That's Someone You Never Forget" - "Don't Be Cruel" - "Little Sister" - "You Don't Have To Say You Love Me" - "His Latest Flame (Marie's The Name)" - "I Just Can't Help Believin'" - "Love Me Tender" - "Anything That's Part Of You" - "Love Me" - "Merry Christmas Baby" - "Anyplace Is Paradise" - "Good Luck Charm" - "I'm Leavin'" - "All Shook Up" - "An American Trilogy" - "She's Not You" - "Burning Love" - "Got A Lot O' Livin' To Do" - "Return To Sender" - "Always On My Mind" - "Devil In Disguise" - "(Let Me Be Your) Teddy Bear" - "Memphis Tennessee" - "One Night" - "Promised Land" - "For The Heart" - "It Hurts Me" - "Jailhouse Rock" - "(You're So Square) Baby I Don't Care" - "Down In The Alley" - "Run On" - "Treat Me Nice" - "Don't" - "Tomorrow Is A Long Time" - "Big Boss Man" - "Santa Claus Is Back In Town" - "Guitar Man" - "Trouble" - "Hard Headed Woman" - "Tiger Man" - "Wear My Ring Around Your Neck" - "A Big Hunk O' Love" - "(Now And Then There's) A Fool Such As I"
Tracks: "Blue Christmas" - "Silent Night" - "White Christmas" - "I'll Be Home For Christmas" - "Santa Claus Is Back In Town" - "If Every Day Was Like Christmas" - "Here Comes Santa Claus" - "O Little Town Of Bethlehem" - "Santa Bring My Baby Back To Me" - "Mama Like The Roses"
Tracks: "His Hand In Mine" - "I'm Gonna Walk Dem Golden Stairs" - "In My Father's House" - "Milky White Way" - "Known Only To Him" - "I Believe In The Man In The Sky" - "Joshua Fit The Battle" - "He Knows Just What I Need" - "Swing Down Sweet Chariot" - "Mansion Over The Hilltop" - "If We Never Meet Again" - "Working On The Building" - "Crying In The Chapel" - "How Great Thou Art" - "In The Garden" - "Somebody Bigger Than You And I" - "Farther Along" - "Stand By Me" - "Without Him" - "So High" - "Where Could I Go But To The Lord" - "By And By" - "If The Lord Wasn't Walking By My Side" - "Run On" - "Where No One Stands Alone" - "We Call On Him" - "You'll Never Walk Alone" - "Who Am I?" - "Only Believe" - "He Touched Me" - "I've Got Confidence" - "Amazing Grace" - "Seeing Is Believing" - "He Is My Everything" - "Bosom Of Abraham" - "Evening Party" - "Lead Me, Guide Me" - "There Is No God But God" - "Thing Called Love" - "I, John" - "Reach Out To Jesus" - "Miracle Of The Rosary" - "Put Your Hand In The Hand" - "I Got A Feelin' In My Body" - "Help Me" - "If That Isn't Love" - "Help Me" (live) - "Why Me Lord?" (live) - "How Great Thou Art" (live) - "Farther Along" - "Oh Happy Day" - "I, John" - "Bosom Of Abraham" - "You Better Run" - "Lead Me, Guide Me" - "Turn Your Eyes Upon Jesus / Nearer My God To Thee" - "When The Saints Go Marching In" - "Just A Little Talk With Jesus" - "Jesus Walked That Lonesome Valley" - "I Shall Not Be Moved" - "Peace In The Valley" - "Down By The Riverside" - "Farther Along" - "Blessed Jesus (Hold My Hand)" - "On The Jericho Road" - "I Just Can't Make It By Myself" - "I Hear A Sweet Voice Calling" - "When The Saints Go Marching In" - "Softly And Tenderly" - "Peace In The Valley" - "It Is No Secret (What God Can Do)" - "I Believe" - "Take My Hand, Precious Lord" - "I Asked The Lord" - "He" - "Oh, How I Love Jesus" - "Show Me Thy Ways, O Lord" - "Hide Thou Me" - "Down By The Riverside / When The Saints Go Marchin' In" - "Sing You Children" - "Swing Down Sweet Chariot" - "Let Us Pray" - "Gospel Medley" - "Lord's Prayer" - "How Great Thou Art" (live) - "Peace In The Valley"
Tracks: "Blue Moon Of Kentucky" - "When My Blue Moon Turns To Gold" - "(Now And Then There's) A Fool Such As I" - "You Don't Know Me" - "Gentle On My Mind" - "It Keeps Right On A-Hurtin'" - "From A Jack To A King" - "Make The World Go Away" - "Kentucky Rain" - "Good Time Charlie's Got The Blues" - "Are You Sincere" - "She Thinks I Still Care" - "I've Got A Thing About You Baby" - "He'll Have To Go" - "I'm So Lonesome I Could Cry" - "I Forgot To Remember To Forget" - "Have I Told You Lately That I Love You" - "Old Shep" - "Your Cheatin' Heart" - "Just Call Me Lonesome" - "Early Mornin' Rain" - "Green, Green Grass Of Home" - "There Goes My Everything" - "Moody Blue" - "I Really Don't Want To Know" - "I'm Movin' On" - "Blue Eyes Crying In The Rain" - "Take Good Care Of Her" - "Funny How Time Slips Away" - "Welcome To My World" - "Snowbird"
Live Tracks: "Blue Suede Shoes" - "I Got A Woman" - "All Shook Up" - "Love Me Tender" - "Jailhouse Rock / Don't Be Cruel" - "Heartbreak Hotel" - "Hound Dog" - "I Can't Stop Loving You" - "Johnny B. Goode" - "Baby What You Want Me To Do" - "Runaway" - "Are You Lonesome Tonight" - "Yesterday / Hey Jude" - "In The Ghetto" - "Suspicious Minds" - "What's I Say" - "Can't Help Falling In Love" - "That's All Right" - "I Got A Woman" - "Hound Dog" - "Love Me Tender" - "There Goes My Everything" - "Just Pretend" - "I Just Can't Help Believin'" - "Something" - "Men Without Broken Hearts" - "Walk A Mile In My Shoes" - "You've Lost That Loving Feeling" - "Polk Salad Annie" - "One Night" - "Don't Be Cruel" - "Love Me" - "Instrumental Vamp" - "Heartbreak Hotel" - "Bridge Over Troubled Waters" - "Suspicious Minds" - "Can't Help Falling In Love" - "When The Snow Is On The Roses" - "See See Rider" - "Release Me" - "Sweet Caroline" - "The Wonder Of You" - "Polk Salad Annie" - "Proud Mary" - "Walk A Mile In My Shoes" - "In The Ghetto" - "Let It Be Me" - "Don't Cry Daddy" - "Kentucky Rain" - "Long Tall Rain" - "I Can't Stop Loving You" - "Suspicious Minds" - "Never Been To Spain" - "You Gave Me A Mountain" - "It's Impossible" - "It's Over" - "Hound Dog" - "Little Sister / Get Back" - "A Big Hunk O' Love" - "The Impossible Dream" - "An American Trilogy" - "Heartbreak Hotel" - "Long Tall Sally" - "Blue Suede Shoes" - "Money Honey" - "Promised Land" - "JT's Midnight" - "If You Talk In Your Sleep" - "I'm Leavin'" - "Why Me Lord" - "Help Me" - "Softly As I Leave You" - "My Baby Left Me" - "It's Now Or Never" - "Hawaiian Wedding Song" - "Trying To Get To You" - "Green, Green Grass Of Home" - "You're The Reason I'm Leaving" - "Big Boss Man" - "Burning Love" - "My Boy" - "And I Love You So" - "Just Pretend" - "How Great Thou Art" - "America The Beautiful"
Tracks: "Always On My Mind" - "And I Love You So" (Alternate Take 1) - "Suspicious Minds" - "Don't Cry Daddy" - "Are You Lonesome Tonight?" - "Surrender" - "It's Now Or Never" - "Wonder Of You" - "You've Lost That Lovin' Feelin'" - "It's Impossible" - "Until It's Time For You To Go" - "You Don't Have To Say You Love Me" - "For The Good Times" - "Spanish Eyes" - "There Goes My Everything" - "Make The World Go Away" - "She Wears My Ring" - "Unchained Melody" - "It's Only Love" - "I Just Can't Help Believin'" - "Let It Be Me" - "Rags To Riches" - "I've Lost You" - "Can't Help Falling In Love" - "Hawaiian Wedding Song" - "Fame And Fortune" - "Good Luck Charm" - "She's Not You" - "Suspicion" - "Girl Of My Best Friend" - "Thrill Of Your Love" - "Pocketful Of Rainbows" - "There's Always Me" - "Love Letters" - "I'll Remember You" - "It Hurts Me" - "You Don't Know Me" - "Love Me Tender" - "True Love" - "I Was The One" - "I Want You, I Need You, I Love You" - "Loving you" - "Love Me" - "Old Shep" - "That's When Your Heartaches Begin" - "Young And Beautiful" - "Don't Ask Me Why" - "As Long As I Have You" - "Don't" - "(Now And Then There's) A Fool Such As I"
Tracks: "Santa Claus Is Back In Town" - "White Christmas" - "Here Comes Santa Claus" - "I'll Be Home For Christmas" - "Blue Christmas" - "Santa Bring My Baby Back (To Me)" - "O Little Town Of Bethlehem" - "Silent Night" - "Peace In The Valley" - "I Believe" - "Take My Hand, Precious Lord" - "It Is No Secret (What God Can Do)" - "O Come All Ye Faithful" - "First Noel" - "On A Snowy Christmas Night" - "Winter Wonderland" - "Wonderful World Of Christmas" - "It Won't Seem Like Christmas (Without You)" - "I'll Be Home On Christmas Day" - "If I Get Home On Christmas Day" - "Holly Leaves And Christmas Trees" - "Merry Christmas, Baby" - "Silver Bells" - "Mama Liked The Roses" - "If Every Day Was Like Christmas"
Tracks: "(Let Me Be Your) Teddy Bear" - "Are You Lonesome Tonight?" - "Love Me Tender" - "It's Now Or Never" - "Don't" - "Suspicious Minds" - "Can't Help Falling In Love" - "Burning Love" - "You Don't Have To Say You Love Me" - "I'm Yours" - "It Hurts Me" - "Young And Beautiful"
Tracks: "Heartbreak Hotel" - "My Baby Left Me" - "Blue Suede Shoes" - "So Glad You're Mine" - "Tutti Frutti" - "One-Sided Love Affair" - "Anyplace Is Paradise" - "Paralyzed" - "Ready Teddy" - "Too Much" - "Hound Dog" - "Any Way You Want Me (That's How I Will Be)" - "Don't Be Cruel" - "Lawdy Miss Clawdy" - "Shake, Rattle And Roll" - "I Want You, I Need You, I Love You" - "Rip It Up" - "Heartbreak Hotel" (Alternate Take 5) - "I Got A Woman" - "I Was The One" - "Money Honey"
Tracks: "(There'll Be) Peace In The Valley (For Me)" - "I Beg Of You" - "That's When Your Heartaches Begin" - "It's No Secret" - "Blueberry Hill" - "Have I Told You Lately That I Love You" - "Is It So Strange" - "Loving You" (Fast Version Take 5) - "Jailhouse Rock" - "Treat Me Nice" (First Movie Version) - "Young And Beautiful" (Record Master) - "Young And Beautiful" (Solo Master) - "Young And Beautiful" (Nightclub Master) - "I Want To Be Free" (Movie Version) - "I Want To Be Free" (Record Master) - "Treat Me Nice" (Second Movie Version) - "Don't Leave Me Now" (Elvis Piano Version) - "Don't Leave Me Now" (Movie Version) - "(You're So Square) Baby I Don't Care" - "G.I. Blues" - "Doin' The Best I Can" - "Wooden Heart" - "Pocketful Of Rainbows" - "Shoppin' Around" - "Frankfort Special" - "Big Boots" (Fast Version) - "Tonight's All Right For Love" - "Summer Kisses, Winter Tears" - "Flaming Star" - "Lonely Man" (Solo Version) - "In My Way" - "Forget Me Never" - "Wild In The Country" - "Lonely Man" - "I Slipped, I Stumbled, I Fell" - "Aloha Oe" - "Hawaiian Sunset" - "Ku-U-I-Po" - "No More" - "Slicin' Sand" - "Steppin' Out Of Line" - "Almost Always True" - "Moonlight Swim" - "Can't Help Falling In Love" - "Make Me Know It" - "Soldier Boy" - "It Feels So Right" - "The Girl Of My Best Friend" - "Surrender" - "Working On The Building" - "Starting Today" - "Kiss Me Quick" - "That's Someone You Never Forget" - "(Marie's The Name) His Latest Flame" - "I Met Her Today" - "Night Rider" - "Just Tell Her Jim Said Hello" - "Echoes Of Love" - "Ask Me" - "Stand By Me" - "Somebody Bigger Than You And I" - "Without Him" - "Mine" - "Singing Tree" - "U.S. Male" - "Also Sprach Zarathustra" - "See See Rider" - "Proud Mary" - "Never Been To Spain" - "You Gave Me A Mountain" - "Until It's Time For You To Go" - "Polk Salad Annie" - "Love Me" - "All Shook Up" - "(Let Me Be Your) Teddy Bear / Don't Be Cruel" - "Heartbreak Hotel" - "Hound Dog" - "How Great Thou Art" - "I Can't Stop Loving You" - "Love Me Tender" - "Suspicious Minds" - "Introductions" - "For The Good Times" - "Burning Love" - "An American Trilogy" - "Funny How Time Slips Away" - "Can't Help Falling In Love" - "Closing Vamp"
Tracks: "Blue Christmas" - "Here Comes Santa Claus" - "White Christmas" - "Santa Bring My Baby Back (To Me)" - "I'll Be Home For Christmas" - "Santa Claus Is Back In Town" - "O Little Town Of Bethlehem" - "Christmas Message From Elvis / Silent Night" - "If Every Day Was Like Christmas" - "O Come, All Ye Faithful" - "The First Noel" - "On A Snowy Christmas Night" - "Winter Wonderland" - "The Wonderful World Of Christmas" - "It Won't Seem Like Christmas (Without You)" - "I'll Be Home On Christmas Day" - "If I Get Home On Christmas Day" - "Holly Leaves And Christmas Trees" - "Merry Christmas Baby" - "Silver Bells" - "(There'll Be) Peace In The Valley (For Me)" - "I Believe" - "It Is No Secret (What God Can Do)" - "His Hand In Mine" - "In My Father's House" - "Known Only To Him" - "Mansion Over The Hilltop" - "Crying In The Chapel" - "How Great Thou Art" - "In The Garden" - "Where No One Stands Alone" - "Somebody Bigger Than You And I" - "Without Him" - "We Call On Him" - "Only Believe" - "Amazing Grace" - "An Evening Prayer" - "He Touched Me" - "He Is My Everything" - "If That Isn't Love"
Tracks: "Trying To Get To You" - "Heartbreak Hotel" - "I Want You, I Need You, I Love You" - "I Got A Woman" - "Got A Lot O' Livin' To Do!" - "(There'll Be) Peace In The Valley (For Me)" - "Trouble" - "Hawaiin Wedding Song" - "Indescribably Blue" - "In The Ghetto" - "Suspicious Minds" - "I'll Hold You In My Heart (Till I Can Hold You In My Arms)" - "Bridge Over Troubled Water" - "You've Lost That Loving Feeling" - "It's Over" - "Seperate Ways" - "Always On My Mind" - "My Way" - "Burning Love" - "Welcome To My World" - "Steamroller Blues" - "I Got A Feelin' In My Body" - "If I Can Dream" - "A Little Less Conversation" - "It Wouldn't Be The Same Without You" - "Jailhouse Rock" - "Anything That's Part Of You" - "You'll Be Gone" - "Too Much Monkey Business" - "Baby What You Want Me To Do" - "I'm So Lonesome I Could Cry" - "Blue Christmas"
Tracks: "That's All Right" - "Baby, Let's Play House" - "Mystery Train" - "Heartbreat Hotel" - "I Was The One" - "Blue Suede Shoes" - "Hound Dog" - "Don't Be Cruel" - "Love Me Tender" - "All Shook Up" - "(There'll Be) Peace In The Valley (For Me)" - "Jailhouse Rock" - "Trouble" - "Fever" - "It's Now Or Never" - "Reconsider Baby" - "Are You Lonelsome Tonight?" - "Little Sister" - "Follow That Dream" - "Can't Help Falling In Love" - "Return To Sender" - "(You're The) Devil In Diguise" - "Boss Nova Baby" - "Viva Las Vegas" - "Big Boss Man" - "A Little Less Conversation" - "If I Can Dream" - "Memoires" - "Suspicious Minds" - "Don't Cry Daddy" - "Kenty Rain" - "Polk Salad Annie" - "The Wonder Of You" - "I Just Can't Help Believin'" - "Burning Love" - "Always On My Mind" - "Steamroller Blues" - "Hurt" - "Moody Blue"
Tracks: "Blue Christmas" (with Martina McBride) - "I'll Be Home For Christmas" (with Carrie Underwood) - "Here Comes Santa Claus" (with LeAnn Rimes) - "Santa Claus Is Back In Town" (with Wynonna) - "Silent Night" (with Sara Evans) - "White Christmas" (with Amy Grant) - "Merry Christmas Baby" (with Gretchen Wilson) - "O Little Town Of Bethlehem" (with Karen Fairchild & Kimberly Schlapman) - "Silver Bells" (Anne Murray) - "O Come All Ye Faithful" (with Olivia Newton-John) - "The First Noel" - "If I Get Home On Christmas Day" - "Winter Wonderland"
Live Tracks: "Opening" - "Blue Suede Shoes" - "That's All Right" - "Heartbreak Hotel" - "Love Me Tender" - "King Creole" - "Bossa Nova Baby" - "Burning Love" - "Memories" - "Can't Help Falling In Love" - "You'll Never Walk Alone" - "Suspicious Minds"
Tracks: "Don't Be Cruel" - "Heartbreak Hotel" - "All Shook Up" - "Jailhouse Rock" - "Blue Hawaii" - "Viva Las Vegas" - "In The Ghetto" - "Suspicious Minds" - "Memories" - "Can't Help Falling In Love" - "The Wonder Of You" - "Always On My Mind" - "Welcome To My World" - "Guitar Man" - "Kentucky Rain" - "An American Trilogy" (live) - "Burning Love" (live) - "Suspicous Minds" - "(There'll Be) Peace In The Valley (For Me)" - "How Great Thou Art" - "if I Can Dream"
Tracks: "Burning Love" - "It's Now Or Never" - "Love Me Tender" - "Fever" - "Bridge Over Troubled Water" - "And The Grass Won't Pay No Mind" - "You've Lost That Loving Feeling" - "There's Always Me" - "Can't Help Falling In Love" - "In The Ghetto" - "How Great Thou Art" - "Steamroller Blues" - "An American Trilogy" - "If I Can Dream"
Tracks: "A Big Hunk O' Love" - "I've Got A Thing About You Baby" - "Suspicious Minds" - "Don't" - "I Just Can't Help Believin'" - "Just Pretend" - "Love Letters" - "Amazing Grace" - "Starting Today" - "Kentucky Rain" - "Memories" - "Let It Be Me" - "Always On My Mind" - "The Wonder Of you" - "Just Pretend"
Tracks: "I've Got Confidence" - "Where No One Stands Alone" - "Saved" - "Crying In The Chapel" - "So High" - "Stand By Me" - "Bosom Of Abraham" - "How Great Thou Art" - "I, John" - "You'll Never Walk Alone" - "He Touched Me" - "In The Garden" - "He Is My Everything" - "Amazing Grace"
5 "(Let Me Be Your) Teddy Bear"
9 Are You Lonesome Tonight? from the LP Girls! Girls! Girls!